There isn't much that goes into making a DIY bulletin board. In some cases, all you need to do is revamp an existing cork board. Other times, you can make a memo board from scratch using a few choice materials. When coming up with bulletin board ideas for your office, stick to a theme that makes sense. For instance, don't make an ultra modern message board if your office is mostly traditional or rustic. These projects will help lead you in the right direction. Chicken wire is a great material to add a rustic element to any project, but it works especially well in this context. This bulletin board is put together by framing out some painted white hardboard and chicken wire that has been painted black. Use a variety of clips to attach memos and calendars to the finished product. One of the most classic bulletin boards is the one that has crisscrosses of ribbon. These can be found in the store, but they are actually quite easy to make, too. You'll need some batting, a fabric of your choice, and a thick ribbon to get started on this project. Unlike chicken wire, this thick wire mesh has a very industrial feel to it. This project takes very little time to complete because all you need to do is purchase some wire mesh and brackets, then adhere it to the wall using a drill. This DIY bulletin board is a take on the metal grid memo board we showed above. Being that this is made with a piece of birch plywood, it is much easier to hang (or not hang) than the metal grids. Also, you won't need any clips since you can nestle your notes in between the elastic. To recreate this DIY bulletin board, you can either purchase a burlap canvas or wrap a blank canvas with burlap fabric. Next, use twine to create spaces for notes, photographs, and other inspiration pieces. Attach these items to the board using decorative mini clothespins. The next time you're in a thrift store, check out the belt section. Chances are you'll find a handful of thin, colorful belts that would work perfectly for this DIY bulletin board project. Make sure to use tacks every few inches to attach the belt to the backing. This way, notes and photos don't slip through. To fill a large empty space in your office, purchase the largest cork board you can afford. Next, cut your favorite fabric to size and decoupage it onto the cork. Gluing the fabric in this way will ensure that push pins will go in without ripping the fabric away from the cork backing. Embroidery hoops can be used is a wide assortment of crafts beyond just embroidering. In this case, the hoops are filled with cork and wrapped with fabric to create small bulletin boards. Hang up an assortment of them on a wall in your office or craft room. To add a bohemian flair to a memo board, stick with natural materials like raw wood. Use light colored paint to add on some bohemian inspired symbols and patterns and then use elastic string to create the memo board. Instead of placing the string in parallel rows, keep the pattern random. Search around your home for things you can turn into a bulletin board. These doors were removed from an old cabinet that had magnetic mesh at the center. The crafter added some fabric wrapped cork squares in the insets for more usable surface area. 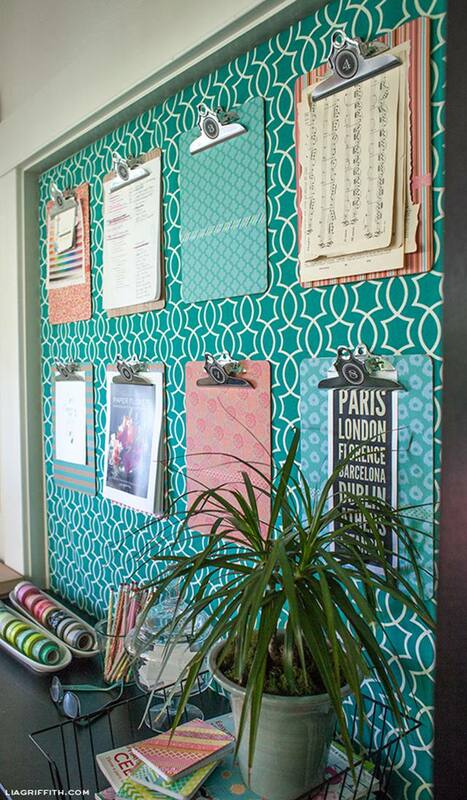 If your office is modern, then this is the bulletin board project for you. To recreate it, tape off a triangle shape in the middle of a wooden block. Paint the shape black or white, then add on three parallel strands of thread to hold your notes. Just about any piece of furniture that has shaker style insets can be converted into a bulletin board. Believe it or not, but this board was originally an end to a crib. Cork board was cut to size and adhered to one panel and dry erase board was added to the opposite side. For those that are extremely organized and have a lot of projects going on at once, this is a great idea for your office. Designate one clipboard for each project and attach inspiration, deadlines, and materials as needed. One way to add more impact to a bulletin board is by layering more than one on a wall. Make each board consistent in terms of color and fabric but vary the size. Some interior designers will tell you that odd number groupings work best, so stick to 3 or 5 frames to start. If you want to make a very large scale bulletin board for not a lot of money, consider using foam board instead of cork board. The foam is cheap and pins stick in the material perfectly. Another nice thing about the project is that the finished product is lightweight, so it's easy to hang.